The latest supplement of the US company All American EFX combines the EFX Kre-Alkalyn Pro with EFX Nytric ! Combines the top products EFX Kre-Alkalyn Pro and EFX Nytric in one capsule ! Product of the "Kölner Liste" (Cologne List); 100% pure and doping free ! Recommended dosage: Intake 2 caps with water approx. 45 minutes before the workout; advanced users should intake 3 to 4 caps. This product was produced before the 13th December 2014, therefore a declaration according to the food information regulations (EU (VO) 1169/2011 is not obligatory. More effectivity is not possible: the unique combination of most high-quality ingredients. The special interplay of EFX Kre-Alkalyn Pro with EFX Nytric in a capsule, makes the EFX Kre-Alkalyn Nitro Pro so unique ! Besides 2400mg EFX Nytric per portion, EFX Kre-Alkalyn Nitro Pro contains 2400mg of Kre-Alkalyn Pro, which can increase the physical performance for springiness training in the scope of shortterm, intensive, physical activity. 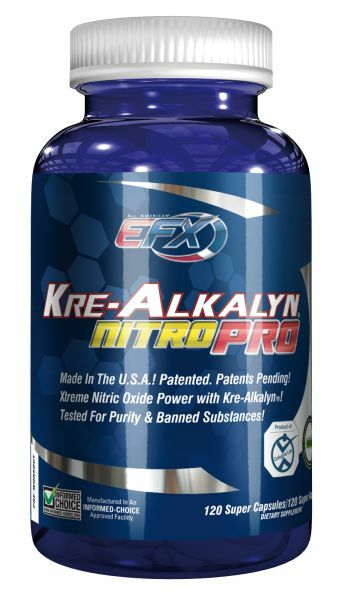 EFX Kre-Alkalyn Nitro Pro is mainly designed for all bodybuilders and strength athletes, though even stamina and ball sportsmen can benefit from EFX Kre-Alkalyn Nitro Pro. EFX Kre-Alkalyn Nitro Pro is of approved top quality, a reason why it can be found on the "Kölner Liste" (Cologne List) which is very important for serious athletes. Here, they get informed about effective, doping-free nutritional supplements to select from most high-quality, clean, and best products of the surplus. Among 29 sportsmen, there were 5 persons, who just started doing sports a few months ago. 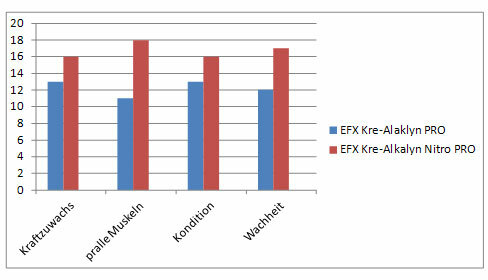 After intake for 4 weeks, EFX Kre-Alkalyn NITRO PRO showed better effects, which comes from the imaging of the manufacturer. Très bon produits effet garantit, merci à l'équipe Sport-Tiedje GmbH pour leur sérieux et leur rapidité de livraison. Très satisfait de tout bonne fête protéinée à tous ! !